"Kiss The Beatles" is just one of the wildly imaginative pop art pieces featured last year at the ICONS Remix Exhibititon held in New York by Los Angeles based French street artist, Mr. Brainwash (MBW), a pseudonym for Thierry Guetta. Guetta, made his entrance onto the contemporary art scene in 2008 with his Los Angles art show “Life is Beautiful”, which drew thousands to the first MR. Brainwash exhibition. Guetta is also known for his creation of the cover art for Madonna's Celebration album back in 2009. A limited 100 signed and numbered sets of 18in. x 18in. 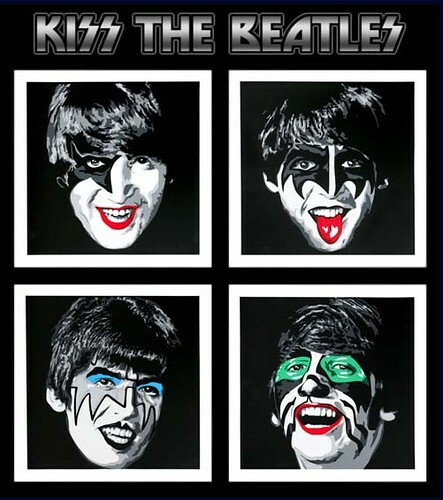 "Kiss The Beatles" screen prints originally sold for $450 each, with some sets later re-sold for as much as $1701 dollars. MR. Brainwash revels in a provocative street art documentary entitled "Exit Through The Gift Shop", that most of his work largely consists of simply "scanning and photoshopping". The cult film is being billed as ‘the world’s first street art disaster movie’. Ty Burr from The Boston Globe descibed the documentary in this way; 'This story's too good, too weirdly rich, to be made up.' Which perfectly sums up my own feelings after sitting mesmerized in front of the 85 minute thrill ride into subversive street art. It's a must see commentary on the hype propping up modern pop art for the internet generation.